Photo: Cliff Maids (Lewisia cotyledon) happily inhabiting a Strawberry pot. Eastern Mojave Vegetation Cliff Maids (Lewisia cotyledon) happily inhabiting a Strawberry pot. This used to be one plant, but it caught some kind of rot. So I cut it up in little pieces, but then I didn't know what to do with 16 little pieces of Lewisia. A Strawberry pot was close at hand and pressed into service. These Lewisias seem to really like it. This photograph was taken at the end of August, 2000, when the plants were launching their second major bloom of the Summer. 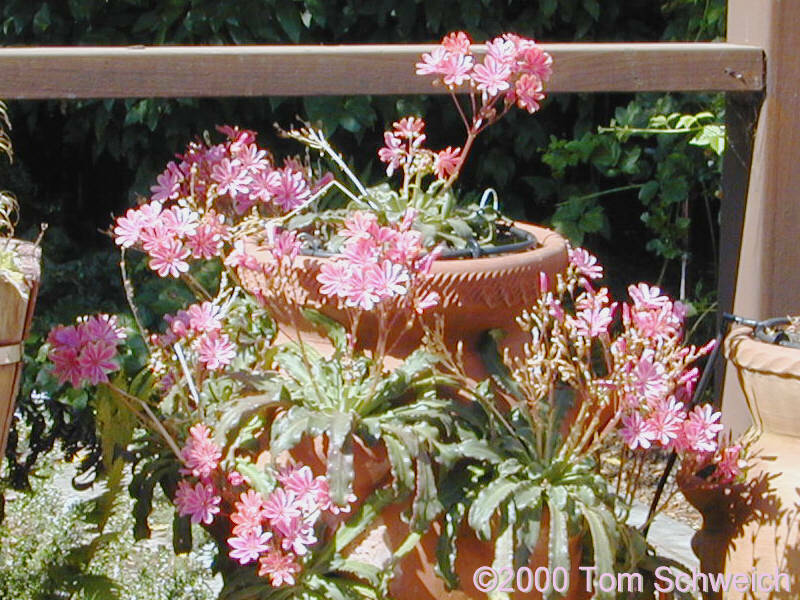 Other photos about Species or Portulacaceae Lewisia cotyledon.